By train is the easiest way to get to the Cinque Terre. From Genoa (Genova), take the local train towards La Spezia and get off at your destination or take the express directly to La Spezia and the local back to your Cinque Terre destination. 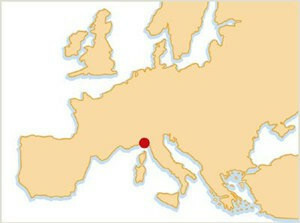 Genoa is about 130 km to the north. From La Spezia, take the local train, treno regionale, towards Sestri Levante, stopping at your destination. Riomaggiore is the first stop after La Spezia. The train is the ideal means of transport in the Cinque Terre. The runs are very frequent, especially during the summer. The Cinque Terre Train Card includes unlimited train runs on the line La Spezia – Levanto, free use of the eco buses and free access to all walking paths and free entry to different museums. It is possible to approach the villages of Cinque Terre by car, but it isn't recommended by travelers who've tried it. As in Venice, there is no use for a car once you're there. Cinque Terre historical centres are closed to car traffic. Riomaggiore and Manarola both have small parking facilities just above their towns and minibuses to carry you and your luggage down. The cheapest option is the big open parking place on the seafront in Monterosso. Other parking facilities are available in Levanto. Riomaggiore and Manarola: From La Spezia (20 Km) by the State Route S.S. n°370 Litoranea delle Cinque Terre. The motorway exit is LA SPEZIA - S.STEFANO MAGRA on the A12 Genova - Livorno or A15 Parma - La Spezia. From the gate, follow for La Spezia and once in town proceed along the seaside finding the signs for CINQUE TERRE - Portovenere. At a certain point these two directions will divide: you will proceed straight up the slope in direction Manarola-Riomaggiore. The last 14 km of your journey will bring you past Riomaggiore and then to Manarola. Vernazza and Corniglia: These villages are the two most isolated of the Cinque Terre and we do not recommend to take the car to these villages due to narrow streets and difficulty to find a place to park. Monterosso: From A12 exit of CARRODANO - LEVANTO follow signs towards Levanto and Monterosso al Mare. After appr. 11 km turn left at the second roundabout towards Monterosso. At the top of the hill you will drive to a short tunnel. Keep to the right for the parking place in Monterosso - Fegina. Petrol stations in the Cinque Terre area can be found in La Spezia, Brugnato and Levanto. The Consorzio Marittimo Turistico runs boat trips from La Spezia to the Cinque Terre as well as excursions along the coast. The nearest airports are the Cristoforo Colombo international airport in Genoa, "Galileo Galilei" international airport in Pisa and Florence Airport. Milan Airport is the major international airport.